Just about everyone is familiar with SLI-type batteries. These are the kind you see in automotive applications. They power starting motors or vehicle radios while the car is off. You don’t want to use an SLI battery to power your trolling motor. The best trolling motor battery is a deep cycle design. While SLI-type batteries are designed for short high-energy bursts, deep cycle batteries are configured to provide optimum performance over long periods of time with a constant discharge rate. We reviewed the top deep cycle batteries for marine applications to find the two best models. In general you get what you pay for. The most expensive batteries provide more proven reliability and more efficient power for trolling motor operations. Still, there are a few less expensive and affordable options that will work. Regardless of what your budget is, don’t be the angler who hooks two or three car batteries to your trolling motor. SLI batteries aren’t made for the job. They create uneven power outputs that could disrupt motor operation, cause excess noise, and cause fish to swim away. 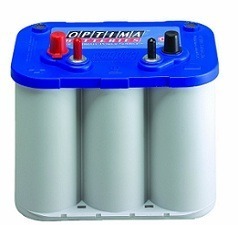 Optima is one of the undisputed leaders in battery design and construction. Their BlueTop deep cycle batteries were developed specifically for tough marine applications. Although a little more expensive than some other options, Optima promises up to three times as many recharges as leading competitor batteries. This means that you can purchase multiple imitator brands, wait for them to wear out, and the BlueTop will still be charging up. Additionally, Optima batteries are designed with vibration resistance. 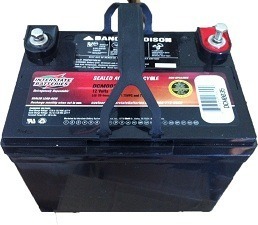 Constant wave or motor vibrations can cause the plates in batteries to move and become damaged. Optima uses wound construction called SPIRALCELL technology. It reduces the damage caused by vibrations. This is a true advantage over a plate design that can completely fall apart and disintegrate under the stress of boating applications. The Optima is also spill proof. The BlueTop is completely sealed so that battery acid can’t leak out. First, this allows mounting in any position, anywhere in the boat. Second, it makes the BlueTop environmentally safer than many other battery styles. One major problem with deep cycle batteries is self-discharge. Over time, rechargeable batteries can lose some of their power while in storage. One of the best features of the BlueTop is its ability to sit for the entire off season (several months) and still hold a charge. As long as the battery is kept at or below room temperature, it will remain ready to go and charged for one year. You can’t go wrong with Optima. They are an industry leader in marine applications for a good reason. The BlueTop is pricey, but in our opinion it’s the best deep cycle battery for a trolling motor. In addition, the BlueTop also works as a starting battery. At about half the price, the Interstate DCM0035 is a solid alternative to the Optima BlueTop. The Interstate Model delivers similar performance and reliably with minimal drawbacks. Interstate is the number one brand in America for replacement batteries. They’ve been designing and building batteries for over half of a century and they understand how to do it well. Technology and innovation are the big differences between Interstate and Optima. Interstate does incorporate new technology into their products, they just don’t like to show it off. They design effective, plain, unassuming products that don’t stand out with the same stylish confidence as Optima batteries. For most applications, the Interstate DCM0035 is going to work perfectly. The robust plate offers extended life, and a computer-generated grid design provides optimum high-power density. Interstate doesn’t use the spiral wrapped technology of the Optima, so it might be prone to damage due to vibrations. Most people we know, however, don’t have any problems with it. The DCM0035 is sealed in a thermally welded case with a bond that prevents leakage. Just like the optima, it can be used in any orientation. Overall, the Interstate DCM0035 is an excellent battery. It isn’t the best available, but it comes in at a close second. Optima takes the top spot with advanced technology and an advanced design that prevents vibration damage.